Mr. Global Warming dude! What the heck? "I am afraid to go out in the sun now, because of the holes in our ozone (layer), I am afraid to breath the air, because i don't know what chemicals are in it...... You don't know how to fix the holes in our ozone layer, you don't know how to bring back an animal now extinct, and you can't bring back the forest that once grew, which is now a desert. If you don't know how to fix it, please stop breaking it....." - 13 year old girl warned the UN delegates in Earth Summit (1992). This is second in the series of articles about climate crisis. This article talks about earth's energy balance, causes and consequences of climate crisis. The first article should set the historical context for you to get interested in knowing about climate crisis. Befor you begin, its worth taking a closer look at IPCC Glossary for Climate Change (Available here also). The fourth assessment report of IPCC published in 2007 makes the most emphatic statement about climate change. "Warming of the climate system is unequivocal, as is now evident from observations of increases in global average air and ocean temperatures, widespread melting of snow and ice, and raising global average sea level", the report also says, "In order to restrict global average temperature rise to 2.0-2.4 degree celsius (acceptable temperature rise in order to avoid horrendous consequences, called as equilibrium temperature) would require limiting concentration of green house gases to 445-490 ppm, particles per million, (compared to 337 ppm in 2005 and about 280 ppm in pre-industrial times)." The concentration of green house gases in the atmosphere was more or less constant before the industrial revolution which started in 18th century. This industrial revolution, no doubt, had a profound impact on socio economic development, but subsequent unsustainable growth has devastated the normal climate. 1. Earth's Energy Balance and the impact on climate change "The survival of life on earth depends on the absorption of incoming solar radiation which warms the surface of the planet. This incoming energy is reflected back into space as low intensity infra red radiation. However, the atmosphere of the earth contains small quantities of carbon dioxide and some other gases (collectively called greenhouse gases of GHGs) which absorb some of the outgoing infrared radiation and reflect it back to earth. Thus increasing the warming of surface [Yojana, June 2008]." In the absence of pollution, the natural amount of GHGs can maintain the thermal equilibrium which can support (normal) life on this planet. But, any further increase in the levels of GHGs give raise to the increase in atmospheric temperature which severely affect the life on earth. 2. What is causing the unprecedented rise in temperature? Greenhouse gases, which have a global effect, tend to warm the earth surface by absorbing some of the infrared radiation it emits. You can read more about this on encyclopedia of earth, climate change student guide, here, here and here. Unethical anthropogenic activities are making life difficult not only for mankind but also for remaining over 30 million species. Following are some of the consequences of rising temperature which may draw your serious attention. "Future climate change is expected to put close to 50 million extra people at risk of hunger by 2020", IPCC report says. Unusual pattern of precipitation. Heavy precipitation events in some areas leading to floods (as it happening in Mumbai these years) and virtually no precipitation in some areas (especially in tropic and subtropic areas). Rise in the sea level. Roughly from 1850s, the sea level has risen by about 10-20 cm. This would displace millions and deprive shelter for mankind. Already two out of 102 islands in Sunderban have submerged due to the raise in sea level [The Hindu]. A one meter sea level rise will inundate up to 30000sq.km in Bangladesh and 5000sq.km in India, displacing millions of coastal dwellers. Shrinking of both the arctic and antarctic ice caps. Large ice sheets in Greenland and Antarctica have already started melting slowly. If this process continues for centuries, the entire Greenland ice sheet could be eliminated and this could lead to sea level rise of about 7m! Variation in the food production due to variation in the climate. Either flood or drought can give raise to food crisis which would increase the risk of hunger. Rise in the ocean temperature. "Sea can absorb and hold a great deal of warming potential in the (ocean) depths. 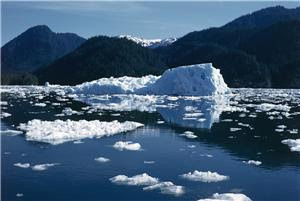 But at some point this potential will manifest itself and change the average temperature of the earth at the surface." Change in the hydrology of rivers. In case of Indian rivers, the river basins of Mahi, Pennar, Sabarmati and Tapi (rivers in western part) would face water shortage conditions. River basins belonging to (southern India) Cauvery, Ganga, Narmada and Krishna would experience seasonal or regular water-stressed conditions while River basins belonging to (Eastern India) Godavari, Brahmani and Mahanadi would not have water shortage but are predicted to face severe flood conditions. Ganga and Yamuna rivers (in Northern India) could face serious floods due to melting of Himalayan glaciers. The effect on various ecosystems is conspicuous and many species are already endangered. The list is pretty big and never ending. The impact is beyond our imagination and has a great potential to break the barriers. You can read more about consequences here, here, here, here(useful data about human influence on climate), IPCC reports, and here(some FAQs). In the subsequent articles I will be discussing about the impact of science on political decisions wrt climate crisis, how the scientific results where successful in making 'climate crisis' a buzzword and also about importance of scientific results and advancements for 'cleaner' future, role of world leaders and scientific community in sharing whatever little is left and the road ahead.